+The first question the Magi had when they followed the bright star was, ” Where is He who has been born King of the Jews? ( Matthew 2:2), and the answer was : He was born in Bethlehem of Judaea …. In a lowly manger , in an animals’ barn . The question that might come to our minds is how could that be ? !, yet who becomes close to Christ the King , knows that he reigns only in humility, ” But made Himself of no reputation, taking the form of a bondservant, and coming in the likeness of men. And being found in appearance as a man, He humbled Himself and became obedient to the point of death, even the death of the cross. ( Philippians 2:7,8). In fact, multitudes, because of their massive pride , have not known Christ, with his great humility . For He only reveals Himself to those with humble hearts . Christ has declared that while speaking to the Father saying : ” I thank You, Father, Lord of heaven and earth, that You have hidden these things from the wise and prudent and have revealed them to babes. ( Matthew 11:25). Happy are the ( humble ) children for the kingdom of heaven has been revealed to them. Jesus the King, who was born in a manger, always calls the meek and the pure in Heart to reign on them, and to rule with him. “Let the little children come to Me, and do not forbid them; for of such is the kingdom of heaven.” ( Matthew 19:14), “Assuredly, I say to you, unless you are converted and become as little children, you will by no means enter the kingdom of heaven.” ( Matthew 18:3). + Then, in our journey with the manger’s baby, the King, we find him at the end of his service on earth, heading to Jerusalem to enter as a King, yet in wondrous meekness and humility, not entering riding on a horse, holding a sword or spear, but riding on a donkey. And here, Zechariah the prophet alerts us that the Messiah entering the city of the great king, despite doing so in great humility, is still the Just king , the victorious over all his enemies. ” Rejoice greatly, O daughter of Zion! Shout, O daughter of Jerusalem! Behold, your King is coming to you; He is just and having salvation, Lowly and riding on a donkey, A colt, the foal of a donkey”. ( Zechariah 9:9)…. And here my beloved, we should submit ourselves and our arrogant hearts under the feet of our meek Christ, reigning on us with joy, fulfilling our daily prayer : ” Your kingdom come. Your will be done On earth as it is in heaven. ( Matthew 6:10). + Finally, we see our king; the manger’s baby revealing his dominion on earth and in heaven, on the cross . David cries saying: ” Say among the nations, “The Lord reigns ” ( Psalms 96:10), and on the cross Pontius Pilate writes:” And an inscription also was written over Him in letters of Greek, Latin, and Hebrew: THIS IS THE KING OF THE JEWS.” (Luke 23:38). 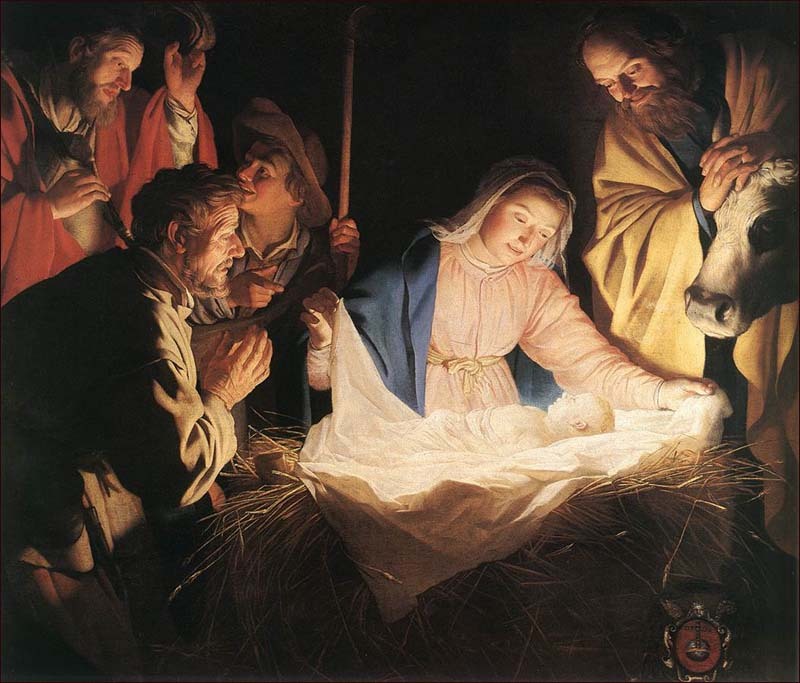 Declaring , unintentionally, that Jesus Christ, who was born in a manger, is the king of the Jews and Gentiles. He reigned through the cross, which was a stumbling for the Jews and ignorance for the Gentiles. It is the secret of the kingdom of heaven. Hence, without daily self crucifixion, denying it for Christ , you can not be a disciple in the kingdom of the born King . + Peace be upon you O Bethlehem , and your manger that encompassed within the King if Kings and Lord of Lords. Today we honor humility and meekness, for from within you and your humble manger came the king of humanity for salvation. Thereby, you are no longer the least , and from your manger we learnt that weakness, poverty,humility and meekness, became to us in Christ the King a treasure of power, wealth, honor, and eternal highness . And here we understand The Lord when he says:” Take My yoke upon you and learn from Me, for I am gentle and lowly in heart, and you will find rest for your souls. ( Matthew 11:29). + Let us sing the praise of joy and peace ” Glory to God in the highest, And on earth peace, goodwill toward men! (Luke 2:14).